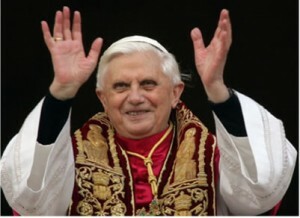 It was bad enough that Pope Benedict XVI’s visit to Madrid cost $72 million dollars during a worldwide economic downturn. (I don’t understand why it costs so much. The Rolling Stones are just as famous and tour all of Europe for considerably less). That’s rich coming from a man who held a key leadership position in a church where a shocking number of clergy raped children, then were systematically shuffled around from church to church to protect the institution’s reputation. Can anything possibly be more relativistic and less truthful than the way the Vatican handled (and continues to handle) this sickening crisis? Please, Mr. Pope — given your record, you are about the last person on earth that should be preaching morals and values. Furthermore, can anyone really argue that Europe is worse off since it has become less religious? As much as the Pope whines, he can’t escape the fact that a non-believing Europe has been remarkably peaceful, civilized, and prosperous. Sometimes, it seems like he yearns for the good ole’ days of religious wars, persecution, and sectarian intolerance. It is ironic that the less influence Rome has had, the more Christ-like Europe has become.